[Jesus said,] "The harvesters are paid good wages, and the fruit they harvest is people brought to eternal life. What joy awaits both the planter and the harvester alike! You know the saying, 'One plants and another harvests.' And it's true. I sent you to harvest where you didn't plant; others had already done the work, and now you will get to gather the harvest." When people come to Christ, when they repent and turn their lives from sin, there is joy. This change is the joy of God's harvest. For the vineyard owner, the joy of the harvest is the fresh taste of ripe grapes, it is the sweet juice running down his chin, and it is the joy of a full harvest. For the planter, it is the dusty smell of grain as it runs through his fingers, the heaviness of bags of freshly milled flour, and the smell of baking bread. For the gardener, it is the sweet taste of fresh vegetables bursting with flavor. For those of us in the Kingdom, it is the wet embrace of one newly baptized, it is the cry of "Hallelujah!" from each friend who has prayed for that moment, and it is the celebration of angels as the lost have been brought home to God. 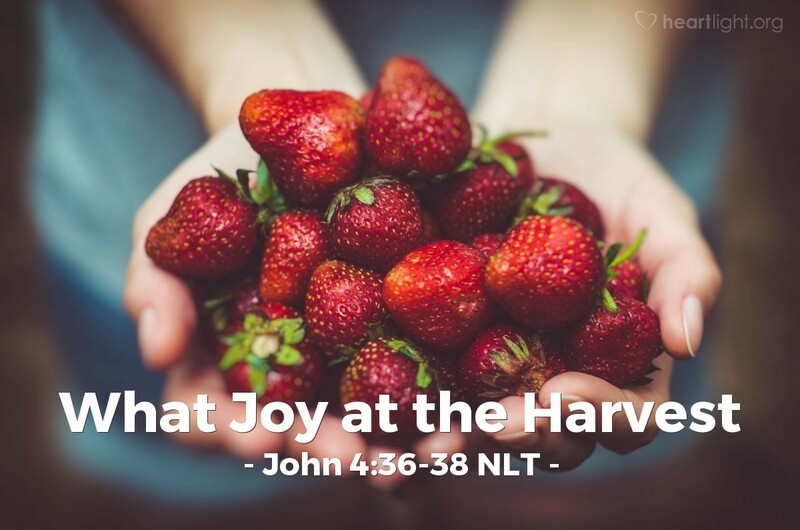 The harvest is about joy! Let's anticipate, pray, and work for the great harvest of God! O dear Father, God of heaven and earth, please let me experience the joy of your harvest in my day like in the days written about in the book of Acts. Make this time the day of salvation, and make me one of your instruments of the harvest. In the name of the Lord of the harvest, Jesus the Redeemer, I pray. Amen.